This beautiful Ostrich Fern grows on the grounds of the famous Weihenstephan Brewery in Freising, Bavaria in Germany, Europe. 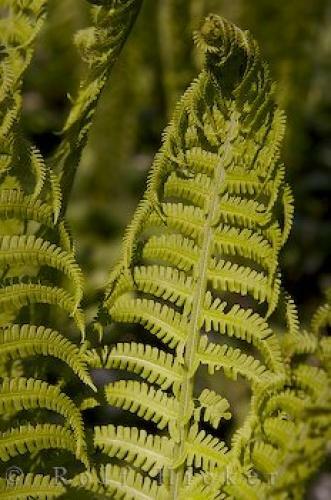 The long fronds of the Ostrich Fern grow to be anywhere from three to five tall in a fairly straight upward direction with a width span of about twelve inches. They narrow out as you get to the tip of each frond and people have referred to them as being similar to that of an ostrich plume. The Ostrich Fern is very easily identified and can grow quite nicely in the shade but on occasion it thrives on a little sunlight. The tip of the fern which is known as the fiddlehead, curls over until it is ready to open to form a new set of leaves.In some parts of North America and Japan, people use the fiddlehead for cooking and it is considered a specialty on the menu. in Freising, Bavaria in Germany. Ferns, Matteuccia struthiopteris, in the grounds of Weihenstephan, Oldest Brewery, Freising, Germany, Bavaria, Europe. I photographed this photo with the digital SLR camera model Canon EOS-1Ds Mark II, aperture of f/8.0, exposure time of 1/80 sec. on ISO 100, as always I used a original Canon Lens, the focus lenght for this picture was 70mm.